This Contest was for Today Only, William Joyce's Birthday - December 11! Congratulations: CStoycos, Lauren Sealy, and @funkifrog! They were chosen throughout the day and awarded the iPad app The Fantastic Flying Books of Mr. Morris Lessmore. Thanks to everyone who spread the word about this giveaway. I had a lot of fun celebrating William Joyce's birthday with you and my family! While you are here, I thought I would let you know that I am trying to become a published children's author. My manuscript, Hey! 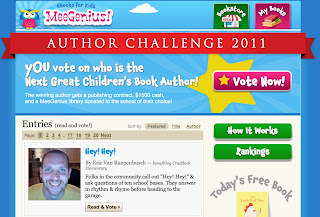 Hey!, is currently up for an online vote over at the website for e-Book publisher, MeeGenius. I would love for you to take a second to read it! (Click Here) According to Mr. Morris Lessmore, "Everyone's story matters." I wholeheartedly agree. After checking out my manuscript check out many of the others too! Or Click Here --- Or Here! --- Or even Here!